Study Italian cooking with Lorenza de’ Medici, author of 20 cookbooks. Stay at her 11th-century estate while taking lessons. Learn sauces, desserts and breads while enjoying the landscape of Tuscany. 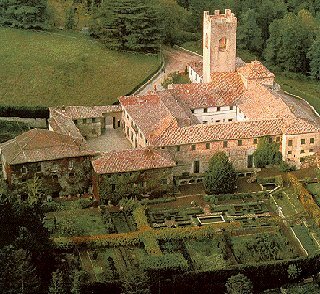 Travel picture of The de’ Medici estate in Tuscany. Sorry, this vacation is no longer active. I am interested in attending a class by Lorenza de’ Medici and would like to get information concerning what is taught. Can you give me information on the class schedules, total cost, and any other requirements I may need to know? Please send me dates for classes. Please provide any information regarding cooking classes with Lorenza de’ Medici. We will be in Northern Italy June through September 2011. Please send details about classes. This will be for two people. We will be in Tuscany in September and want to know if you are offering any 1,2 or 3 day cooking classes. Please respond as quickly as possible. We are making our reservations. 1) I live with a historian – how is Lorenza de medici related to the medicis when they died out many years ago? 2) does she own coltabouno because I have been there several time and did not know that she owned it? 3) how much are your tours? Interested in attending a class at Lorenza’s Cooking School in Tuscany with 2 friends. Please email me particulars such as dates, prices and what the course includes. First of all….you are my favorite chef. My wife and I would love to visit you and learn from you. We live in New Hampshire and recently visited Mary Ann Esposito who alos lives in New Hampshire. My family came to the U.S. from the Parma region ( Varsi and Bardi) and my mother’s parents are from outside of Naples. I am making Cioppino for Cristmas Eve and I am looking for your recipe?